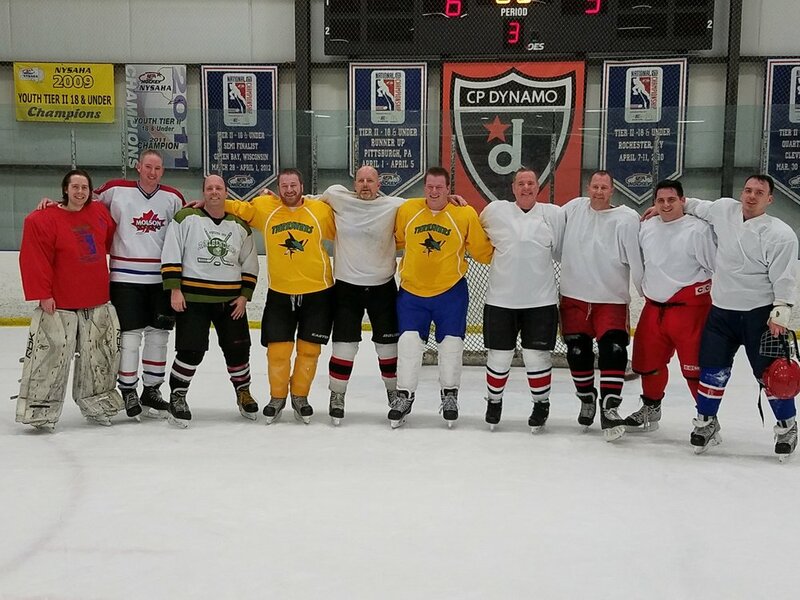 CLIFTON PARK, NY – the alumni won a hard-fought contest vs. the actives, during the annual alumni/active hockey game on Saturday, March 23rd, winning 6-5 in regulation. Once again, undergraduate sniper Stuart Irwin ’21 led active scoring with a hat trick in a repeat of last year’s action. But, alas, despite a large contingent of active spectators, Stuart did not receive the traditional shower of hats for his feat. Perhaps better hockey fan education is required or maybe actives don’t wear hats anymore or can’t afford them given today’s tuition. Stuart’s hat trick was supplemented by 2 goals from future actives Daniel Keefe, age 12, and Logan Keefe, age 9, to leave the actives with 5 goals. The active roster was rounded out by Chris Holler ‘19, Kris Whelan ‘20, Stuart Arthur ‘21, Andy Chafy ’21, and Alex Jenouri ‘22. The active’s netminder was veteran Casey Manifold ’20 who admirably denied dozens of alumni shots from crossing the goal line. The alumni team consisted of Don Burgio ’89, Will Hallam ’91 (1 goal), Dave Tomkins ’92 (1 goal), Shawn Daly ’01 (2 goals), Dan Keefe ’01 (1 goal), Ben Hurley ’15, Zach Hurley ’15, Tom Cronin ’16 (1 goal), and Christopher D ’16, with veteran goalie Greg Desmond ’14 in the pipes. The alumni also had the periodic assistance of face-off specialist and future NHL’er Landon Keefe, age 5, who won all of his face-offs. Lambda Chi Alpha graciously provided our two refs. The game was held at the Capital Ice Arena in Clifton Park given schedule conflicts with our usual barn (RPI Houston Fieldhouse). Despite the smaller seating area, approximately 25 spectators, consisting of alumni, actives, and guests, attended the game with a raucous alumnus cheering section led by Steve Fallick ’68. Blueliner Dave Tomkins ’92 was also noted for having the best-looking goal when he went top shelf using a wicked wrister to roof the puck from the top of the right circle in the active’s zone.